Axiom Care Solutions helps navigate BC’s complex health care system to support you to live at home. Call us today for your customized home care solution. Need Home Care Services? Click here now. Our Home Care Navigation and Personal Support services are available across the lower mainland including but not limited to Burnaby, Coquitlam, Port Coquitlam, Port Moody, Vancouver, North Vancouver and West Vancouver. Clients and their families many times feel stress and confused about making the right choices about their care needs which will allow them to live comfortably at home. While juggling between work and family responsibilities, many adult children, spouses or other loved ones may feel guilty and confused about what to do to enable their family member to live at home and how to leverage public health services to support them. Axiom Care Solutions are experts at working with clients and family members to assess their current needs and wants and to collaborate with public health care providers in a constructive way to ensure that individuals can live or recover comfortably at home. 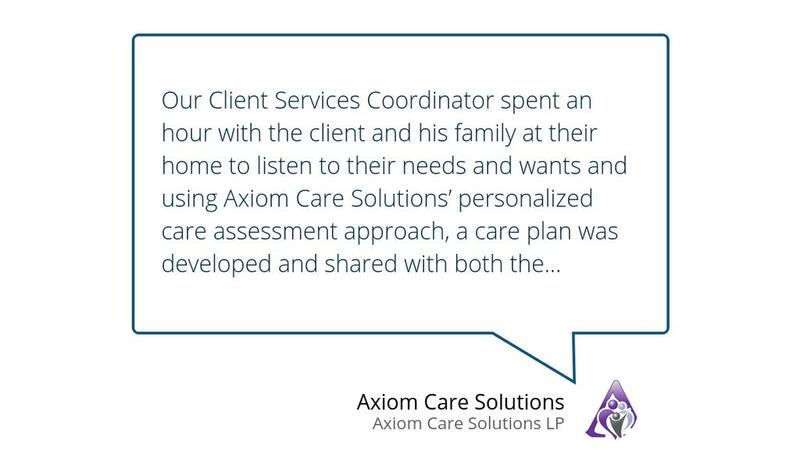 Where the public system does not provide certain services, Axiom Care Solutions helps identify options and coordinates services to enable clients to optimize their quality of life at home. We also work with service providers outside the health care system as a one stop service to ensure all your legal, financial, and even home renovations if required are addressed. As a private service provider, we provide our clients a VIP customized and personalized experience. We pride ourselves in helping people live at home with dignity and comfort. Our Personal Care services offer a wide range of ways to help our clients continue living independently in their own home by supporting them in their daily activities such as bathing, meal preparations, housekeeping and companionship. We only hire fully licensed and registered staff who value quality care and service to help clients who require support for routine household tasks to enable them to live in a safe, clean and healthy home environment. Axiom Care uses the best technology available to allow our clients and their families access to a portal where they can see their services and engage with us 24/7. As a private home care provider, our services are customized to meet your personal needs and wants and does not take a "cookie cutter" approach. Contact us today for a free, no obligation assessment in your own home.